A dog who sustained critical injuries in an alleged dog fight over the weekend has been named George in honor of George Bengal, the late director of humane law enforcement for the Pennsylvania Society for the Prevention of Cruelty to Animals. Pennsylvania SPCA officials arrived at the scene of an alleged dog fight in progress over the weekend in North Philadelphia, where they found several injured dogs and one that had died. According to a statement from the PSPCA, eight dogs were rescued alive from the 600 block of West Diamond Street on Sunday, Feb. 12, and one dog was found dead. Two were injured; one (pictured above) was found in critical condition, the PSPCA said. 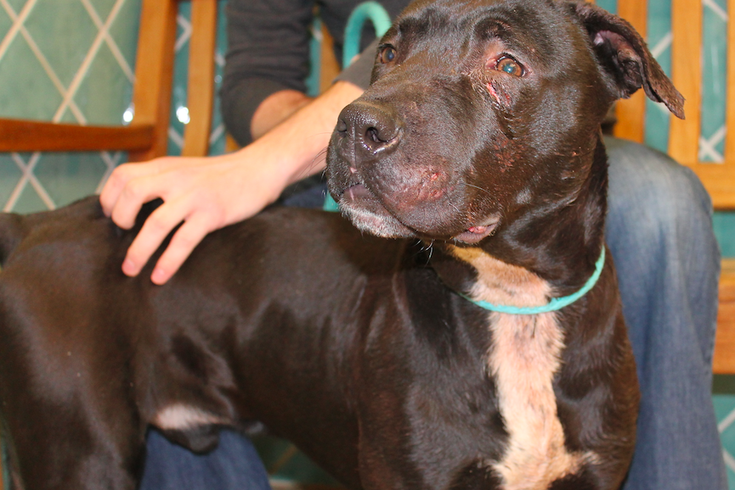 According to the PSPCA, there was evidence at the scene that was consistent with dog fighting. The PSPCA said Philadelphia police officers also arrived and took one individual into custody, while a number of others reportedly fled. There is no word on whether there have been any arrests or charges at this time, through the PSPCA is continuing its investigation and asking the public for assistance. The dog pictured above, named George after George Bengal, the late director of humane law enforcement for the PSPCA, is one of the rescued animals who reportedly sustained critical injuries and is being cared for by the PSPCA. The PSPCA notes that funds raised through The George Bengal Fund to End Animal Cruelty are dedicated to the Pennsylvania SPCA’s Humane Law Enforcement operations in efforts of this sort. All tips can be left anonymously through the PSPCA’s cruelty hotline, 866-601-7722.